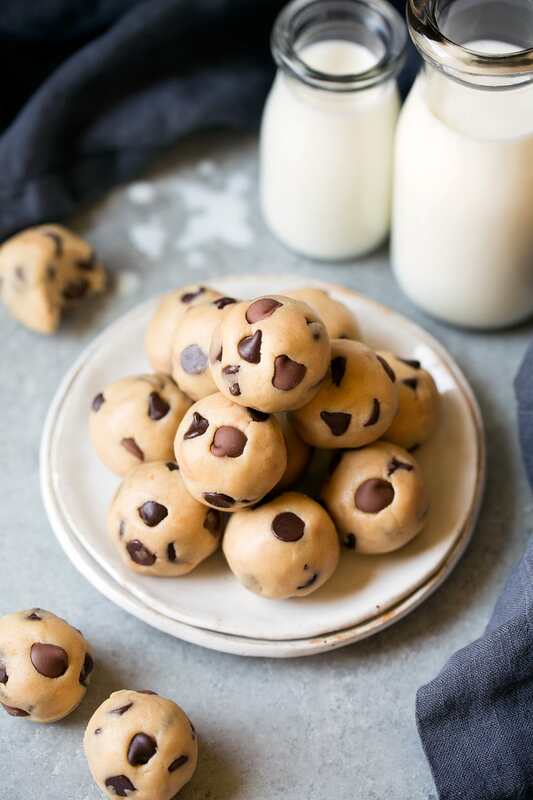 Edible egg-free Cookie Dough Bites that are sure to please! 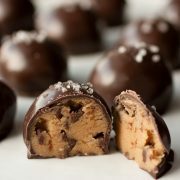 Deliciously addictive and always the first thing to go at parties! 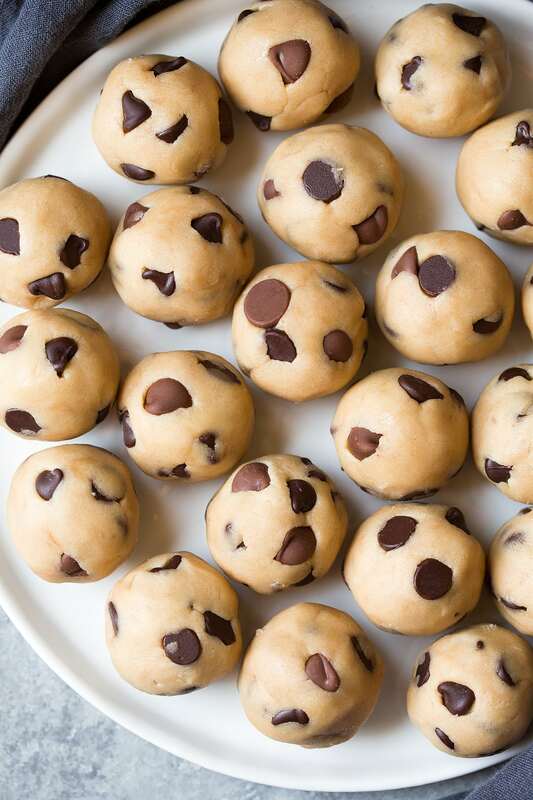 Is there anything in the world that’s better than cookie dough? 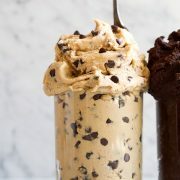 It is definitely one of my favorite foods but words out that regular cookie dough is not safe to eat for a number of reasons. We’ve all heard of the possibility of salmonella in raw eggs but more recently there have been e. coli scares in raw flour. Yikes. I remember getting recalls in some of the flour I purchased just last year because of that possibility. 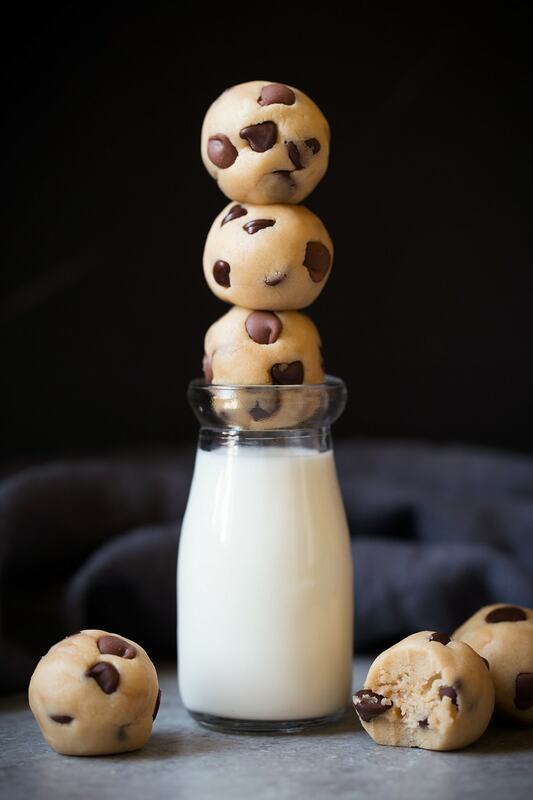 I’m not going to lie though, I’m still dumb and live on the edge and eat (small amounts) of raw cookie dough (which obviously I don’t recommend) but when I want to eat a lot, and when I want to serve it at a party or to my kids then I’m all about this edible cookie dough! Yes baking the flour first adds more time but it heats it to that temperature past 160 degrees where e. coli couldn’t survive. All this bacteria talk though is such a drag. Heat treat flour in oven. Cream butte, sugars and salt. Let’s talk more about these delicacies! They taste just like cookie dough but instead of egg they have half and half (or cream). So they are rich and oh so irresistible. 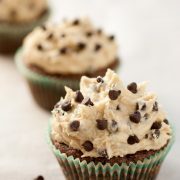 And of course they have plenty of chocolate chips because that’s a main highlight of cookie dough. I like to add two kinds but use what you have. You could even add in a pinch or two of baking soda if you like that added flavor. And if you don’t have the patience, skip rolling them into balls and eat the dough straight from the bowl by the spoonful! Once you try them you’ll be hooked. I’ve made these 3 times in the last month and I’m not stopping! My kids even found my hidden stash in the freezer and have been eating them frozen. My one daughter said she thaws them under water (lol, gross). I told you though, no one can resist. 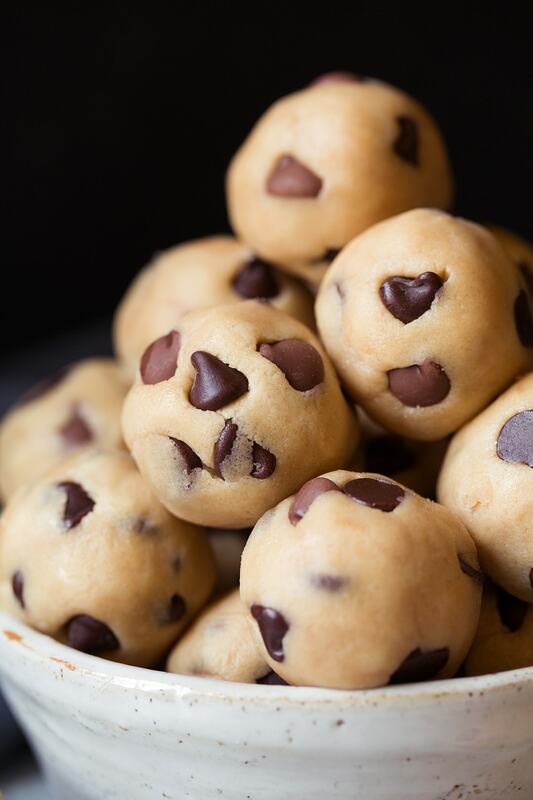 Perfectly little bite size chocolate chip cookie dough treats! These are incredibly addictive and always the first thing to go at parties. Made with heat treated flour and on eggs so you don't need to worry about getting sick. Preheat oven to 350 degrees. Sprinkle flour evenly onto a rimmed 18 by 13-inch baking sheet. Bake in preheated oven 5 minutes, then remove and let cool completely. In the bowl of an electric mixer fitted with the paddle attachment cream together butter, brown sugar, granulated sugar and salt until pale and fluffy about 3 minutes. Stir in half and half and vanilla extract. Add in flour and mix just until combined. Drizzle in more half and half, 1/2 Tbsp at a time, as needed to bring dough together. Mix in chopped chocolate chips (set some aside if you want to press some into top after shaping for looks). 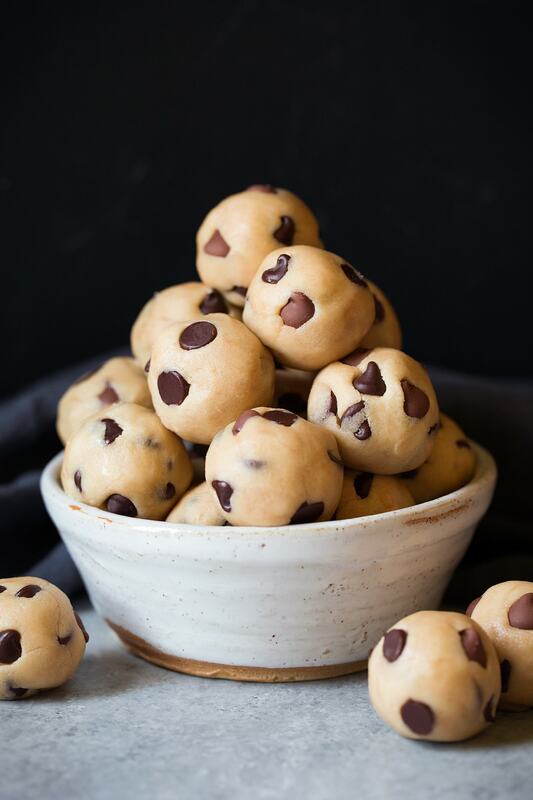 Scoop dough out about 1 tablespoon at a time and roll into balls. Place on parchment paper. 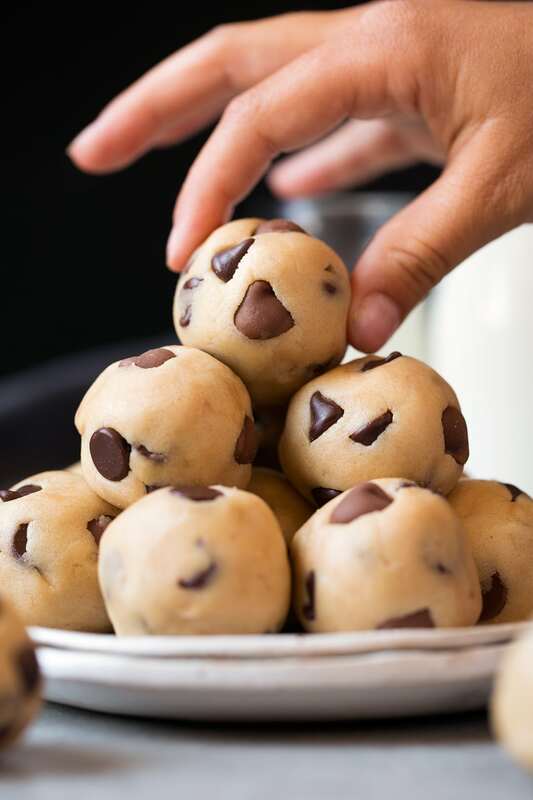 Serve immediately or store cookie dough bites in an airtight container in refrigerator. Recipe originally shared May 2012. Updated August 2017.